It’s not every day that eager cries of “Gaumarjos” and the clink of Champagne flutes echo through a Welsh bookshop. 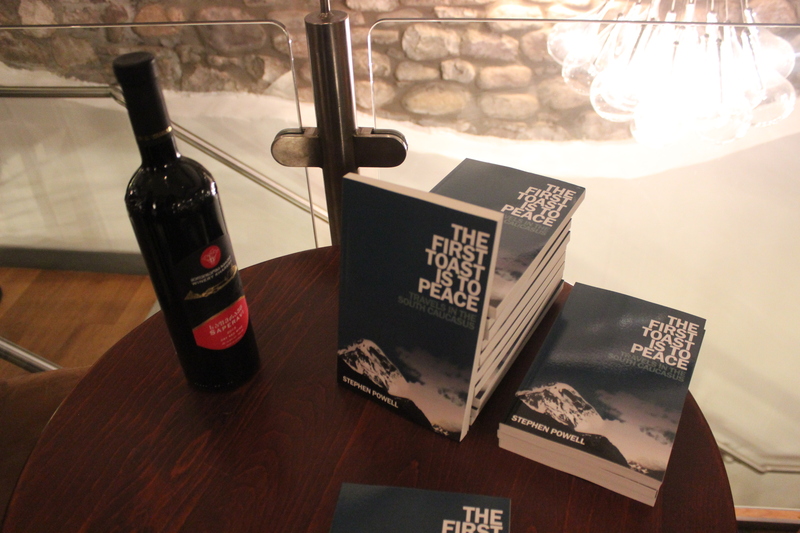 But they did on February 17 when I launched “The First Toast is to Peace, Travels in the South Caucasus” out into the wide world. About two dozen people turned up for the party at Book-ish, a book shop in my home town of Crickhowell in South Wales. We had Georgian-style toasting. We had Champagne, Saperavi and Mtsvane wines from Georgia and Caucasus canapés. A friend who worked a long time in publishing wrote with thanks for a “really fabulous party – much the jolliest book launch I have ever been to”. I was the first tamada (toastmaster) and naturally I intoned “Mshvidobas gaumarjos” – to peace. A big thank you to my daughters Megan and Rachel, the illustrators of the book, and to friends for making it to the celebration. 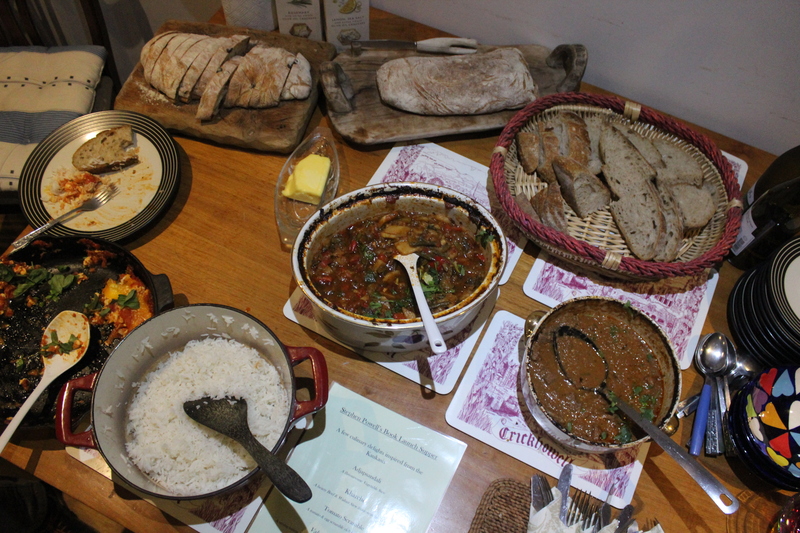 Thanks too to Book-ish and to Welsh chef Zoë Powell for cooking up a Caucasus storm at my place after the book shop event ended. ”The First Toast is to Peace” is available from a number of websites, but if you cherish small book shops please support Book-ish. I also commend buying from my publishers at silverwoodbooks.co.uk. One of my favourite words in the world is “Gaumarjos”. I learned to love this word in Kakheti, a region of eastern Georgia famed both for its wine and its tortured history of foreign invasion. “Gaumarjos” is the standard Georgian toast and it means “To your victory”. The emphasis is on the first syllable and you speak the toast with feeling. In this word of sinew and muscle are fused the celebration of wine as central to national culture and scorn for Georgia’s enemies. If you have been to Georgia but haven’t spent an evening rising to your feet again and again, declaiming “Gaumarjos” with all the others at table, then you need to return and make a proper job of it. One wine-soaked evening in particular stands out in my memory, but I mustn’t run ahead of myself. After Abkhazia I travelled over to Kakheti by marshrutky, via Tbilisi. I wanted to fill another gap in my knowledge of Georgia. In earlier travels I had missed the pretty town of Sighnaghi, a few kilometres before the Azerbaijan border. Sighnaghi is a two-hour, six-lari ($2.60) ride from Tbilisi. It is an engaging, hilly town, all cobbled streets and red-tiled roofs. 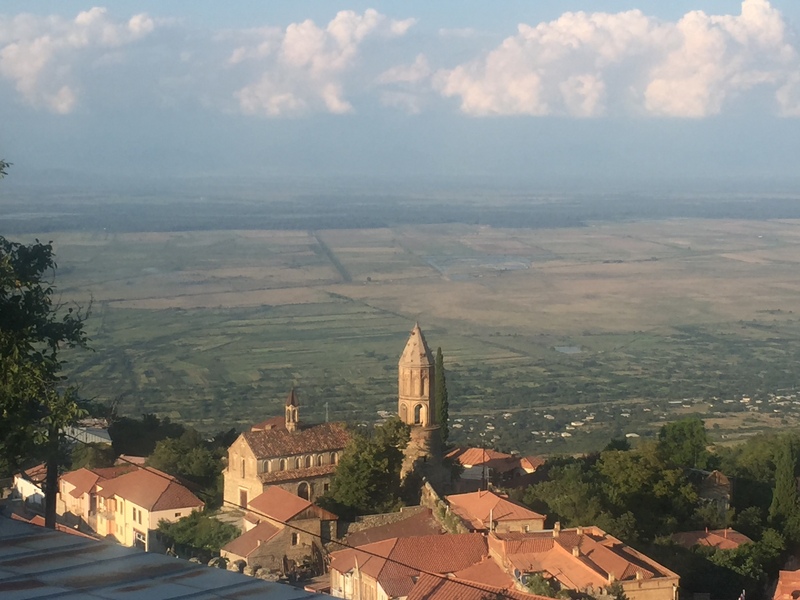 My guide book is right – the town, perched high above a plain, has a very Italian feel. Somebody has had the daft idea of basing quad bikes smack in the middle of it, but the overall impression is still of a town in beautiful countryside, peaceful but plugged in to the wider world. I found my guesthouse, which faced north with beguiling views of the plain below. 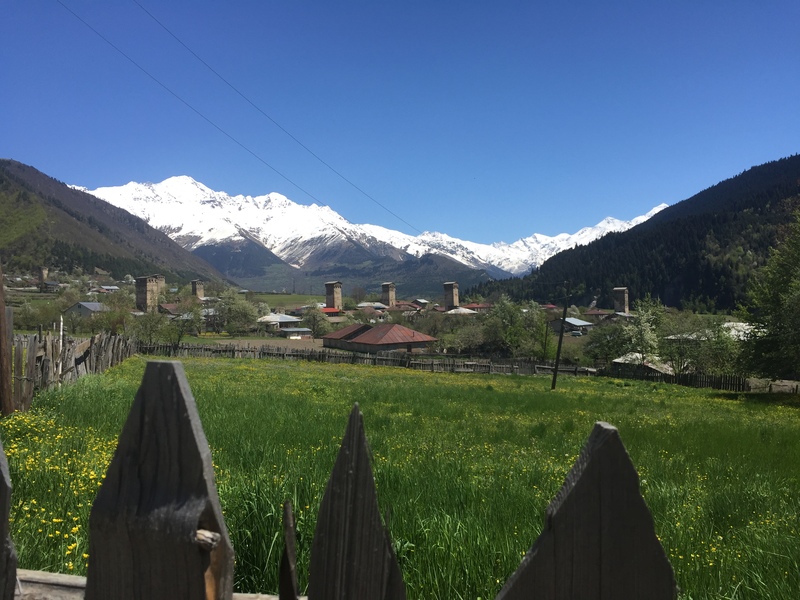 Beyond, hidden in a heat haze, were the Caucasus. 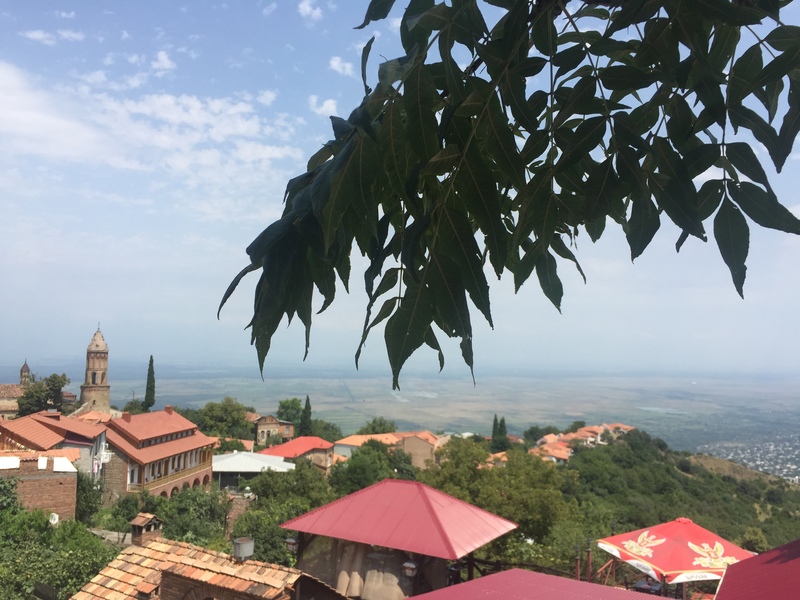 My focus in Sighnaghi was to learn about Georgian wine, but first I had to attend to my health. More than a week after falling ill I still wasn’t right, so for the first time in the Caucasus I went to a doctor. There was no-one waiting and I walked straight into the surgery for a Russian-language consultation with a Georgian doctor. She said I had had food poisoning and gave me instructions on diet. She also prescribed pills and charged 30 lari ($13) for her time. I got better and was impressed by Georgia’s health service. Before delving into the world of wine I also took in the local museum, which teaches the visitor some of Kakheti’s doleful history. Persia’s 17th century ruler Shah Abbas I invaded Georgia three times and on his third go devastated Kakheti and took 200,000 captives. The museum says Abbas wanted to take Georgia’s farmers and warriors to Iran and to eradicate Georgia as a serious rival in the silk trade. Pirosmani’s trademark style is primitivist, spare, quirky — his figures have no expressions on their faces. He was born in a Kakheti village to a family of peasants who owned a small vineyard and some of his art honoured the life of the peasant and the grape harvest. One painting on display features a peasant in a white belted tunic and black cap, standing with a basket of grapes in front of him. His wife holds a smaller basket, also brimming with grapes, and to his left is a well-laden vine. Another more ambitious composition shows stages of the harvest from picking the grapes to preparing for the community feast. Pirosmani kept body and soul together by a succession of jobs such as signboard maker, railway conductor and dairy farmer. Most of his paintings were done on black oilcloth, a medium suited to his modest means. Today Pirosmani is accorded an important place in the pantheon of Georgia’s artistic heroes. The museum describes him as “a live bearer of the ‘cultural memory’ of his country”. In this role of cultural bearer, Pirosmani celebrated wine-making — it was in his blood and as a good Georgian he knew how vital this was to the land of his birth. The Georgian National Museum has cultivated grape seeds which carbon dating puts between 6,000 and 8,000 years old. Georgia likes to think of itself as the cradle of wine civilization. 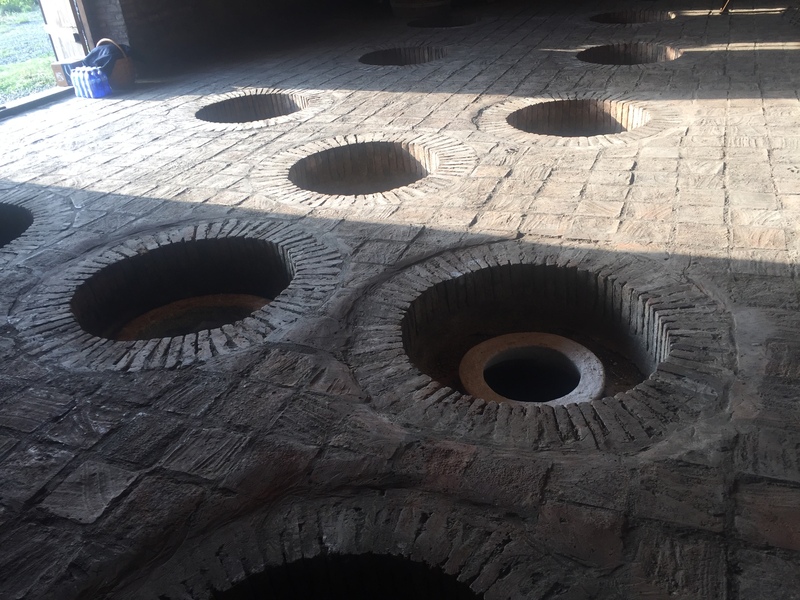 Traditional methods of making wine, using earthenware vats called qvevri sunk into the earth, are still used in Georgia. Not only that, but these age-old methods are now finding favour in other parts of the world. Feiring, an American, says the world has gone crazy for making wine in clay pots and someone is making them in Texas. With its long history and wonderfully distinctive wines, Georgia has become a kind of super-star in the little firmament of natural wine producers. 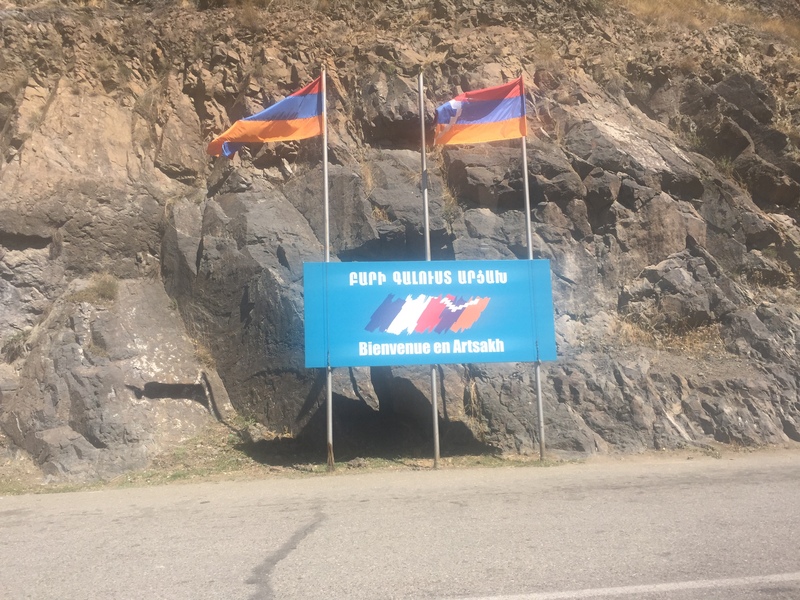 I meet several wine producers in Sighnaghi and they are a doughty bunch of men determined to keep the flag of authentic Georgian winemaking flying high. 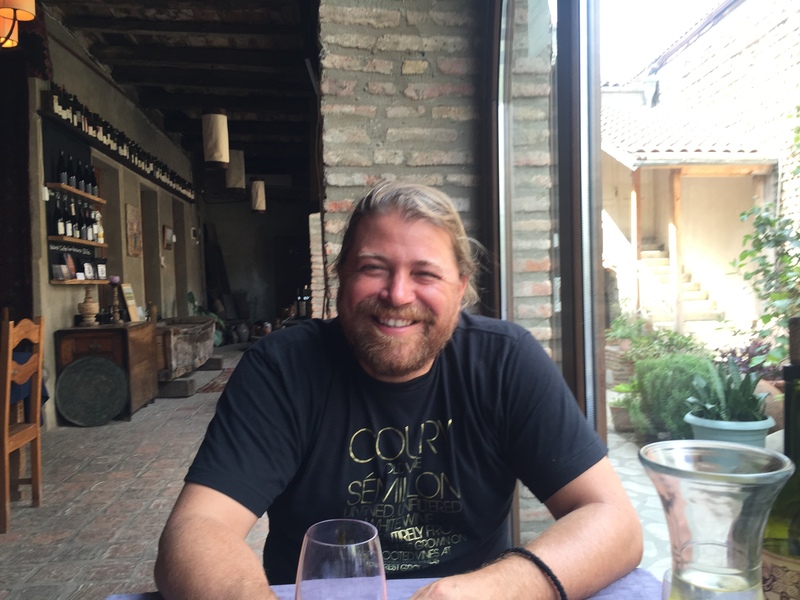 I have an introduction to John Wurdeman, an American artist who has settled in Sighnaghi and is one of the business partners in Pheasant’s Tears, a small wine producer with a big reputation. John invites me to lunch at the Pheasant’s Tears restaurant in Sighnaghi. When I turn up he is in full flow in Russian, addressing a tour group. He arrives at our table a little later and business matters are whirling in his head. “The Latvian ambassador wants to have dinner with me at Azarphesha,” he says to someone, referring to one of his Tbilisi restaurants. But he quickly focuses on the meal at hand. John is a commanding figure, stocky, bearded, with a warm smile and an obvious ease in the polyglot world he has created for himself. His wife is a Georgian folk singer and the language of the home is Georgian. So how did a man born in 1975 into a family of artists in New Mexico end up in the Republic of Georgia? He says he first came to Georgia in 1995 when he was an art student in Moscow. In Moscow he started to study Georgian, to go to Georgian concerts and to hang out with Georgians. Members of the diaspora in Moscow invited him to their country in 1995. In 1998 he left Moscow for good and came to Georgia to live. He met his wife, Ketevan, and they married the following year. Gradually the idea of winemaking took shape, after it dawned on John that rural Georgia offered much better fare than what was served in so many of the country’s “Soviet-style restaurants”. On Georgian food John talks with knowledge and a touch of poetry. He tells me about one of his restaurants in Tbilisi, Piala, unusual in that it has rotating ethnic menus. Every now and again John interrupts his gastronomic tour of the Caucasus to draw my attention to what we are eating. We share many tasty dishes, including some delicious oyster mushrooms prepared with yogurt, rosemary, garlic and chilli. Georgia, he notes, still has a lot of families growing food and selling in farmers’ markets. But Georgian agriculture is not all organic. “We are trying to spearhead and push a conscious return to organic farming. And that’s, by the way, strained water buffalo yogurt,” says John, pointing to one of the dishes filling our small table. “And this wine here is a very unusual one. It is a rose Rkatsiteli. So it is actually made from a white grape.” John explains that it has had three weeks of “skin contact”, meaning that the grape skins spent three weeks in the qvevri with the rest of the fruit and the result is a wine that has come out looking red. I tell him that it’s an achievement to keep painting in his daily routine. “It keeps my head sane, otherwise it’s very difficult,” says John, who then races on to tell me about his Living Roots gastronomy and wine tour business, which has a ranch and a planned brewery. John discerns what he calls a “certain plasticity” in life in much of the West. He receives chefs and artists of different kinds from outside of Georgia every year and it seems part of his calling is to provide them with a refuge from plasticity. John stresses the need for Georgia to keep its acuteness, to pass on to the next generation the importance of the songs and the winemaking. Pheasant’s Tears now sells to 22 countries. It produces 60,000 bottles of wine a year from grapes grown on 24 hectares in five locations. John’s account of the international success of Pheasant’s Tears puts me in mind of UNESCO’s decision to place the qvevri on its Intangible Cultural Heritage list — basically a U.N. stance that the qvevri is a jolly good thing. John expands on Georgia’s place on the UNESCO list. “The first thing that was protected as a cultural heritage in Georgia was the polyphony, Georgian polyphony as a masterpiece of intangible European culture. And the second thing was the knowledge of how to build qvevri and make wine in them. And this is very important because uniqueness inherently imbues value. In a world of growing globalism you come empty-handed to the table if you mimic others. But if you have your own uniqueness, then you bring something new, you make the table more diverse. As we talk I learn about yet another project. 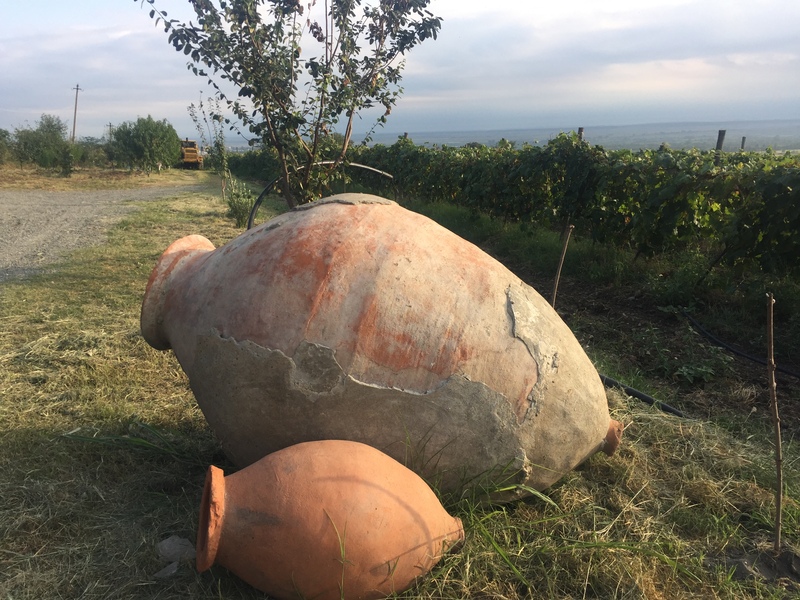 Pheasant’s Tears is teaming up with a French organic winemaker, Thierry Puzelat, to make wine from ancient varieties of grapes to be grown on terraces left over from the 12th and 13th centuries in the south Georgian region of Meskheti. I ask John whether he sees his work in terms of what one person and associates can do to heal the Earth. “I think, Steve, my philosophy would be that a small country has no other option except to do highly specialised products in limited amounts and sell them in a fair trade. And that mass production can only work if you are large enough to be the biggest in that profile. So if we are going to talk about doing resort tourism here we would have to be able to outperform Turkey or Bulgaria or Spain or Cyprus which wouldn’t work, we’re not big enough to be able to do that. 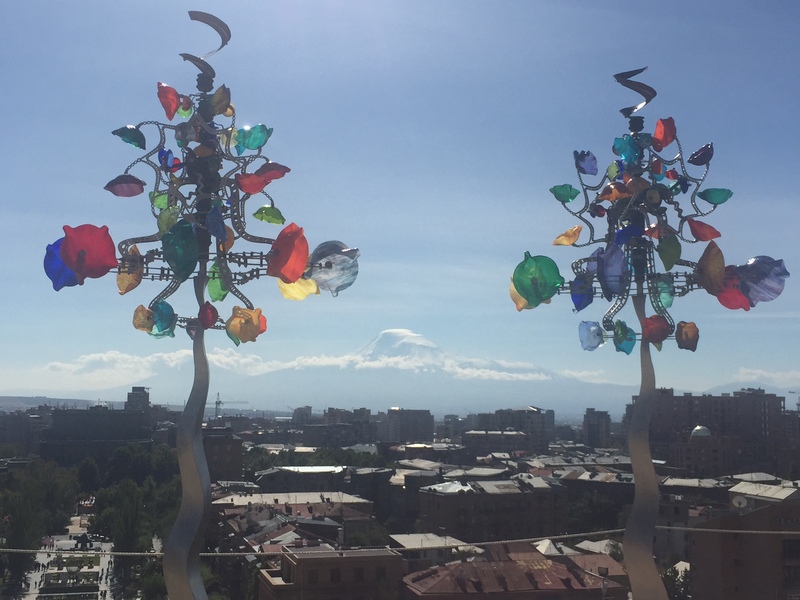 But we could do something where people that want organic food and rare wine and interesting ancient polyphonic songs and a visit to ancient monasteries were able to pay a little bit more for a very special and authentic experience. I say that part of the customer base for the resort-style tourism he decries is Russia. So do the Russians he meets have sympathy for the vision of tourism he embraces? In 2006, when Georgia was moving closer to the West and relations with Russia were deteriorating, Moscow banned imports of Georgian wine. These resumed in 2013, but John is not the only person in Georgia who is wary of close economic ties with Russia. It has been quite a lunch — great food, conversation and wine — and I express gratitude to John for the distilled thoughts of his on a range of matters. “Thoughts need decantation, not only wine,” says John as our lunch comes to a close. Two days later, we meet again. John invites me to join a breakfast with his Japanese importers at the Pheasant’s Tears vineyard close to town. The vineyard is by the village of Tibaani, near its sixth century monastery of St. Stephen. It benefits from long summer sun, more than 14 hours a day, and the soil is lime rock, chalk and dark clay on the surface with sandy loam and gravel below providing good drainage. There are two men and one woman in the Japanese group and shortly after eight we sit down with John to a hearty breakfast including a delightful sparkling wine which Pheasant’s Tears sells to the Noma restaurant in Copenhagen. It doesn’t come much better than this! After breakfast I visit the final resting place of St. Nino at Bodbe Convent just outside Sighnaghi. It is a serene place, part of the charm of this little corner of Georgia. Then at lunchtime I am drinking again, back at Pheasant’s Tears for a wine tasting session laid on for the Japanese. John has invited a Frenchman, Vincent, who also makes wine in Georgia, to come with his wines and all in all we taste more than 20 wines. The wine writer Alice Feiring, in her work on Georgian wine, enthuses about “sensual explosions of blossom water and honey without the sweetness” and “church-evocative spices of myrrh and frankincense”. I am too far gone in my cups to add anything to that. Part of the charm of the occasion is that John, Vincent and one of the Japanese men all speak Georgian and use it for some of their conversation together. At evening time we are still drinking, having wandered from the home of one winemaker to another. Our last port of call is the home of John Okro, an urbane British-trained telecoms specialist who now makes natural wine. His house is right at the top end of Sighnaghi with views to die for over the town and plain below. It is here, over dinner, that we clink glasses and shout “Gaumarjos” again and again and again. Many stories get told and I will recount just one of them, as related by John. Some wine experts from the Languedoc region of France travelled to Georgia, to the vineyard of John’s business partner Gela Patalishvili. They couldn’t believe that he avoided chemicals and kept asking him what he used. The first couple of times he ignored them, but at the third time of asking, he gave a spirited reply.